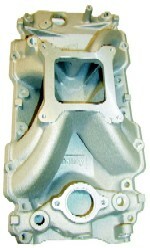 For use in marine applications with Edelbrock Performer manifolds and others of similar design. Complies with U.S. Coast Guard safety standards. Cast surfaces are indited with Teflon-coated shafts and pump arm for maximum protection. 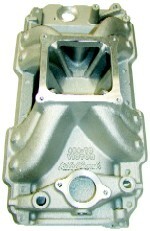 Other features include modified bowl venting, specially designed throttle shafts, accelerator pump seal, 3/8” inverted flare fuel inlet fitting, tube in airhorn for fuel pump vent, 5-1/8” flame arrestor flange, universal throttle lever and a revised secondary system for improved transient performance in marine applications. 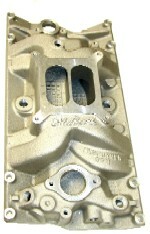 Use our Carb Stud Kits #8008 or #8024 if needed. P/N 715-5 Throttle Cable Bkt.